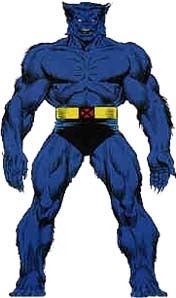 BELOW: The Beast's words border on mutant supremacism, which Professor Xavier sternly warns him against. 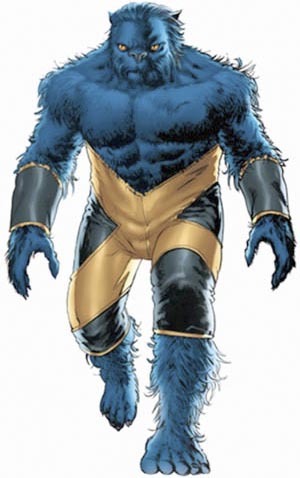 The Beast (Hank McCoy): And what of my woeful condition. The agile Beast, hobbling about like some mere vulnerable Homo sapiens! Professor Charles Xavier: Careful, Hank! Remember our cardinal rule -- we never consider normal humans as our inferiors! The Beast: I stand corrected, sir! Forgive my impetuosity! Astonishing X-Men (vol. 3) #1 (July 2004): "Gifted: Part One"
Astonishing X-Men (vol. 3) #2 (Aug. 2004): "Gifted: Part Two"
Astonishing X-Men (vol. 3) #9 (Mar. 2005): "Dangerous: Part Three"
Astonishing X-Men (vol. 3) #10 (May 2005): "Dangerous: Part Four"
Astonishing X-Men (vol. 3) #12 (Aug. 2005): "Dangerous: Part Six"
Astonishing X-Men (vol. 3) #14 (June 2006): "Torn: Part Two"
Astonishing X-Men (vol. 3) #15 (Aug. 2006): "Torn: Part Three"
Astonishing X-Men (vol. 3) #16 (Oct. 2006): "Torn: Part Four"
Astonishing X-Men (vol. 3) #17 (Nov. 2006): "Torn: Part Five"
Astonishing X-Men (vol. 3) #19 (Feb. 2006): "Unstoppable: Part One"
Astonishing X-Men (vol. 3) #20 (Feb. 2006): "Unstoppable: Part Two"
Astonishing X-Men (vol. 3) #21 (May 2006): "Unstoppable: Part Three"
Astonishing X-Men (vol. 3) #22 (Oct. 2006): "Unstoppable: Part Four"
Astonishing X-Men (vol. 3) #23 (Jan. 2008): "Unstoppable: Part Five"
Astonishing X-Men (vol. 3) #24 (Mar. 2008): "Unstoppable: Part Six"
Astonishing X-Men: Ghost Boxes #1 (Dec. 2008): "Being an Journal by Miss Emma Frost of New Portsmouth Bay in the State of New Albion"
Astonishing X-Men: Ghost Boxes #2 (Jan. 2009): "4"
The Avengers (vol. 1) #209 (July 1981): "The Resurrection Stone"
Captain America & the Korvac Saga #1 (Feb. 2011): "Strange Days"
The Defenders (vol. 1) #112 (Oct. 1982): "Strange Visitor from Another Planet!" The Defenders (vol. 1) #113 (Nov. 1982): "Moon Madness!" The Defenders (vol. 1) #114 (Dec. 1982): "Dance of Darkness/Dance of Light!" The Defenders (vol. 1) #115 (Jan. 1983): "A Very Wrong Turn!" Marvel Super-Heroes (vol. 2) #8 (Winter 1992): "Jim Starlin Gallery"
Marvel Universe: Millennial Visions #1 (Feb. 2002): "Magic is the New Religion"
New X-Men (vol. 1) #114 (July 2001): "E for Extinction: One of Three"
New X-Men (vol. 1) #116 (Sep. 2001): "E is for Extinction: Conclusion"
New X-Men (vol. 1) #117 (Oct. 2001): "Danger Rooms"
New X-Men (vol. 1) #120 (Jan. 2002): "Germ Free Generation, Part 3 of 3"
New X-Men Annual 2001 (Sep. 2001): "The Man from Room X!" S.W.O.R.D. #1 (Jan. 2010): "No Time to Breathe"
S.W.O.R.D. #2 (Feb. 2010): "Aliens Go Home: Part One"
S.W.O.R.D. #3 (Mar. 2010): "Aliens Go Home Part Two"
S.W.O.R.D. #4 (Apr. 2004): "Aliens Go Home: Part Three"
S.W.O.R.D. #5 (May 2010): "Illegal Aliens"
Siren #2 (Nov. 1995): "Red Shift"
Spider-Man (vol. 1) #15 (Oct. 1991): "The Mutant Factor!" Venom (vol. 2) #33 (June 2013): "Monsters Anonymous"
What If? Astonishing X-Men #1 (Feb. 2010): "What If Danger Became a Bride of Ultron?" What If? Astonishing X-Men #1 (Feb. 2010): "Say What? Astonishing X-Men"
Wolverine (vol. 2) #162 (May 2001): "The Hunted: Part 1"
Wolverine Annual 2000 (Nov. 2000): "Family"
X-Factor Annual #3 (1988): "Changes!" X-Men (vol. 2) #53 (June 1996): "False Fronts"
X-Men Unlimited (vol. 1) #27 (June 2000): "New Dawn Rising"
X-Men Unlimited (vol. 1) #28 (Sep. 2000): "A Plague Among Us"
X-Men: Divided We Stand #2 (July 2008): "Lights Out"
X-Men: Millennial Visions 2001 (Jan. 2002): "Exiles: Static Problematic"